SYMLIN use with insulin increases the risk of severe hypoglycemia, particularly in patients with type 1 diabetes. When severe hypoglycemia occurs, it is seen within 3 hours following a SYMLIN injection. Serious injuries may occur if severe hypoglycemia occurs while operating a motor vehicle, heavy machinery, or while engaging in other high-risk activities. Appropriate patient selection, careful patient instruction, and insulin dose reduction are critical elements for reducing this risk. These highlights do not include all the information needed to use SYMLIN safely and effectively. See full prescribing information for SYMLIN. SYMLIN use with insulin has been associated with an increased risk of severe hypoglycemia, particularly in patients with type 1 diabetes. Hypoglycemia risk may be reduced by appropriate patient selection, careful patient instruction, and insulin dose reduction (5.1, 5.2). Upon initiation of SYMLIN, reduce mealtime insulin dose by 50%. Monitor glucoses frequently and individualize subsequent insulin dose adjustments (2.1). Type 1 Diabetes: Start at 15 mcg subcutaneously before major meals. Increase in 15 mcg increments to a maximum premeal dose of 30 or 60 mcg; if not tolerated, reduce to 30 mcg, as tolerated (2.2). Type 2 Diabetes: Start at 60 mcg subcutaneously before major meals then increase to 120 mcg before meals, as tolerated (2.2). Wait at least 3 days between dose titrations to minimize nausea (2.1). 1.5 mL SymlinPen ® 60 disposable multidose pen-injector, (1000 mcg/mL) for 15, 30, 45, and 60 mcg doses (3). 2.7 mL SymlinPen ® 120 disposable multidose pen-injector, (1000 mcg/mL) for 60 and 120 mcg doses (3). Severe hypoglycemia: Increased risk particularly for type 1 diabetes. Upon initiation of SYMLIN, reduce mealtime insulin dose by 50% and frequently monitor blood glucoses (5.2). Never share a SymlinPen between patients, even if the needle is changed (5.3). Do not mix SYMLIN and insulin: Mixing can alter the pharmacokinetics of both products. Administer as separate injections (5.4, 7.1). Slows gastric emptying: Administer concomitant oral medications at least 1 hour before or 2 hours after SYMLIN if rapid onset or threshold concentration is critical (5.6, 7.2). Most common adverse reactions (incidence ≥5% and higher incidence than placebo): nausea, vomiting, anorexia, headache (6.1). SYMLIN is indicated as an adjunctive treatment in patients with type 1 or type 2 diabetes who use mealtime insulin therapy and who have failed to achieve desired glucose control despite optimal insulin therapy. SYMLIN dosage differs depending on whether the patient has type 1 or type 2 diabetes [see Dosage and Administration (2.2, 2.3)]. SYMLIN should be used only in patients who can fully understand and adhere to proper insulin adjustments and glucose monitoring. Insulin and SYMLIN dose adjustments should be made only as directed by a healthcare professional skilled in the use of insulin. When initiating SYMLIN, reduce mealtime insulin doses, including premixed insulins, by 50% to reduce the risk of hypoglycemia. To reduce the risk of nausea, wait at least 3 days before titrating SYMLIN to the next dose increment. Monitor blood glucoses frequently, including pre- and post-meals and at bedtime, particularly when initiating SYMLIN or increasing the SYMLIN dose. After the initial 50% reduction in mealtime insulin dose, individualize insulin dose adjustments based on glycemic control and tolerability (e.g., if nausea occurs it may affect the dose of insulin required). An increased frequency of mild-to-moderate hypoglycemia should be viewed as a warning sign of increased risk for severe hypoglycemia. If SYMLIN therapy is discontinued for any reason (e.g., surgery or illnesses), the same initiation protocol should be followed when SYMLIN therapy is reinstituted [see Dosage and Administration (2.2)]. Reduce mealtime insulin doses (including premixed insulins) by 50%, then initiate SYMLIN at 60 mcg subcutaneously, injecting immediately prior to each major meal. Increase the SYMLIN dose from 60 to 120 mcg prior to each major meal when no clinically significant nausea has occurred for at least 3 days. If significant nausea persists at the 120 mcg dose, the SYMLIN dose should be decreased to 60 mcg. Reduce mealtime insulin doses by 50%, then initiate SYMLIN at 15 mcg subcutaneously, injecting immediately prior to each major meal. Increase the SYMLIN dose to the next increment (30, 45, or 60 mcg) when no clinically significant nausea has occurred for at least 3 days. If significant nausea persists at the 45 or 60 mcg dose level, the SYMLIN dose should be decreased to 30 mcg. If the 30 mcg dose is not tolerated, discontinuation of SYMLIN therapy should be considered. SYMLIN should be administered subcutaneously immediately prior to each major meal (≥250 kcal or containing ≥30 grams of carbohydrate). SYMLIN should be at room temperature before injecting to reduce potential injection site reactions. Each SYMLIN dose should be administered subcutaneously into the abdomen or thigh. Administration into the arm is not recommended because of variable absorption. Injection sites should be rotated so that the same site is not used repeatedly. 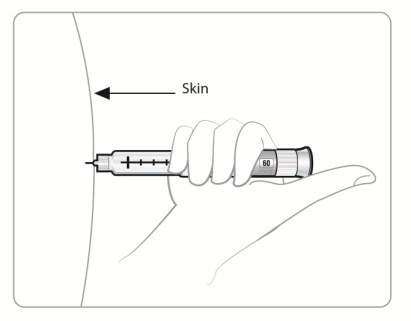 The injection site selected should also be distinct from the site chosen for any concomitant insulin injection. recurrent unexplained hypoglycemia that requires medical assistance. noncompliance with self-monitoring of blood glucose concentrations. noncompliance with insulin dose adjustments. noncompliance with scheduled healthcare provider contacts or recommended clinic visits. 1.5 mL disposable multidose SymlinPen ® 60 pen-injector containing 1000 mcg/mL pramlintide (as acetate). 2.7 mL disposable multidose SymlinPen ® 120 pen-injector containing 1000 mcg/mL pramlintide (as acetate). serious hypersensitivity reaction to SYMLIN or to any of its product components. have failed to achieve adequate glycemic control despite individualized insulin management. poor compliance with current insulin regimen. poor compliance with prescribed self blood glucose monitoring. recurrent severe hypoglycemia requiring assistance during the past 6 months. require the use of drugs that stimulate gastrointestinal motility. SYMLIN alone does not cause hypoglycemia. However, SYMLIN is indicated to be coadministered with mealtime insulin therapy, and in this setting there is an increased risk of severe hypoglycemia, particularly in patients with type 1 diabetes. If severe hypoglycemia associated with SYMLIN occurs, it is usually seen within the first 2 to 3 hours following a SYMLIN injection. If severe hypoglycemia occurs while operating a motor vehicle, heavy machinery, or while engaging in other high-risk activities, serious injuries or death may occur. Therefore, when introducing SYMLIN therapy, appropriate precautions need to be taken to avoid increasing the risk for severe hypoglycemia. These precautions include frequent monitoring of pre- and post-meal glucose combined with an initial 50% reduction in doses of mealtime insulin [see Dosage and Administration (2.1, 2.2)]. Early warning symptoms of hypoglycemia may be different or less pronounced under certain conditions, such as longstanding diabetes; diabetic neuropathy; use of medications such as beta-blockers, clonidine, guanethidine, or reserpine; or intensified glycemic control. The addition of any anti-diabetic medication, such as SYMLIN, to an existing regimen of one or more anti-diabetic medications (e.g., sulfonylurea), or other medications that can increase the risk of hypoglycemia may necessitate further insulin dose adjustments and particularly close monitoring of blood glucose. SymlinPen must never be shared between patients, even if the needle is changed. Pen-sharing poses a risk for transmission of blood-borne pathogens. Mixing SYMLIN and insulin can alter the pharmacokinetics of both products which may result in inadequate glucose control or hypoglycemia. Therefore, SYMLIN and insulin must always be administered as separate injections and should never be mixed [see Drug Interactions (7.1) and Clinical Pharmacology (12.3)]. SYMLIN slows gastric emptying, which may delay the absorption of concomitantly administered oral medications. Administer the concomitant oral medication at least 1 hour prior to SYMLIN injection or 2 hours after SYMLIN injection if the rapid onset or threshold concentration of the concomitant medication is a critical determinant of its effectiveness (such as with analgesics, antibiotics, and oral contraceptives) [see Drug Interactions (7.2) and Clinical Pharmacology (12.3)]. SYMLIN slows gastric emptying. SYMLIN is not recommended for patients taking other medications that alter gastrointestinal motility [see Drug Interactions (7.3)]. Patients may experience erythema, edema, or pruritus at the site of injection. These minor reactions usually resolve in a few days to a few weeks. In some instances, these reactions may be related to factors other than SYMLIN, such as irritants in a skin cleansing agent or improper injection technique. Adverse reactions (excluding hypoglycemia, which is discussed separately below) commonly associated with SYMLIN when coadministered with a fixed dose of insulin in the 26- to 52-week, placebo-controlled trials in patients with type 1 diabetes and patients with type 2 diabetes on mealtime insulin are presented in Table 1 and Table 2, respectively. Examples of inflicted injury included among others, abrasions, bruises, burns, fractures, lacerations, and muscle strains. Most adverse reactions were gastrointestinal in nature. The incidence of nausea is higher at the beginning of SYMLIN treatment and decreases with time in most patients. Gradual titration of the SYMLIN dose minimizes the incidence and severity of nausea [see Dosage and Administration (2)]. Coadministration of SYMLIN with mealtime insulin increases the risk of severe hypoglycemia, particularly in patients with type 1 diabetes [see Boxed Warning and Warnings and Precautions (5.1)]. Two definitions of severe hypoglycemia were used in the SYMLIN clinical trials. Patient-ascertained severe hypoglycemia was defined as an episode of hypoglycemia requiring the assistance of another individual (including help administering oral carbohydrate) or requiring the administration of glucagon, intravenous glucose, or other medical intervention. Medically-assisted severe hypoglycemia was defined as an episode of hypoglycemia that was classified as a serious event by the investigator or that required glucagon, intravenous glucose, hospitalization, paramedic assistance or an emergency room visit. The incidence of severe hypoglycemia during the SYMLIN clinical development program is summarized in Table 3 and Table 4. Patient-ascertained severe hypoglycemia: Requiring the assistance of another individual (including help ingesting oral carbohydrate) and/or requiring the administration of glucagon injection, intravenous glucose, or other medical intervention. Medically-assisted severe hypoglycemia: Requiring glucagon, intravenous glucose, hospitalization, paramedic assistance, emergency room visit, and/or assessed as a serious adverse event by the investigator. The following adverse reactions have been identified during post-approval use of SYMLIN. Because these reactions are reported voluntarily from a population of uncertain size, it is not always possible to reliably estimate their frequency or establish a causal relationship to drug exposure. The pharmacokinetic parameters of pramlintide are altered when SYMLIN is mixed in the same syringe with regular, NPH, and 70/30 premixed formulations of recombinant human insulin. SYMLIN and insulin must not be mixed and must be administered as separate injections [see Dosage and Administration (2.4), Warnings and Precautions (5.4), and Clinical Pharmacology (12.3)]. SYMLIN has the potential to delay the absorption of concomitantly administered oral medications. When the rapid onset or threshold concentration of a concomitant orally administered medication is a critical determinant of effectiveness (such as with analgesics, antibiotics, and oral contraceptives), the medication should be administered at least 1 hour prior to SYMLIN injection or 2 hours after SYMLIN injection [see Warnings and Precautions (5.5) and Clinical Pharmacology (12.3)]. Due to its effects on gastric emptying, SYMLIN should not be considered for patients taking medications that alter gastrointestinal motility (e.g., anticholinergic agents such as atropine) or medications that slow the intestinal absorption of nutrients (e.g., alpha-glucosidase inhibitors). Patients using these medications have not been studied in SYMLIN clinical trials [see Warnings and Precautions (5.6)]. The following are examples of medications that may increase the susceptibility to hypoglycemia when administered with SYMLIN: oral anti-diabetic products, angiotensin converting enzyme (ACE) inhibitors, disopyramide, fibrates, fluoxetine, monoamine oxidase inhibitors, pentoxifylline, propoxyphene, salicylates, somatostatin analogs, and sulfonamide antibiotics. SYMLIN and these drugs should be coadministered with caution. No adequate and well-controlled studies have been conducted in pregnant women. Studies in perfused human placenta indicate that SYMLIN has low potential to cross the maternal/fetal placental barrier. Embryofetal toxicity studies with SYMLIN have been performed in rats and rabbits. Increases in congenital abnormalities (neural tube defect, cleft palate, exencephaly) were observed in fetuses of rats treated during organogenesis with 0.3 and 1.0 mg/kg/day (10 and 47 times the exposure resulting from the human dose of 360 mcg/day based on area under the plasma concentration curve [AUC], respectively). Administration of doses up to 0.3 mg/kg/day SYMLIN (9 times the human dose of 360 mcg/day based on AUC) to pregnant rabbits had no adverse effects in embryo fetal development; however, animal reproduction studies are not always predictive of human response. SYMLIN should be used during pregnancy only if the potential benefit justifies the potential risk to the fetus. It is unknown whether SYMLIN is excreted in human milk. Many drugs, including peptides, are excreted in human milk. Therefore, SYMLIN should be administered to nursing women only if it is determined by the healthcare professional that the potential benefit outweighs the potential risk to the infant. SYMLIN has been studied in patients ranging in age from 15 to 84 years of age, including 769 patients ≥65 to 75 years of age and 87 patients ≥75 years of age. No consistent differences in the efficacy and safety of SYMLIN have been observed in older patients, but greater sensitivity in some older individuals cannot be ruled out. As is recommended for all patients, SYMLIN and insulin regimens should be carefully managed to minimize the risk of severe hypoglycemia. The dosing requirements for SYMLIN are not altered in patients with mild (creatinine clearance [ClCr] 60-89 mL/min), moderate (ClCr 30-59 mL/min) or severe renal impairment (ClCr 15-29 mL/min). SYMLIN has not been studied in patients with end-stage renal disease [see Clinical Pharmacology (12.3)]. SYMLIN use has not been studied in patients with hepatic impairment [see Clinical Pharmacology (12.3)]. No consistent differences in the efficacy and safety of SYMLIN have been observed between men and women in SYMLIN clinical trials (n=2799 for male and n=2085 for female). No consistent differences in the efficacy and safety of SYMLIN have been observed among patients of differing race/ethnicity in SYMLIN clinical trials (n=4257 for Caucasian, n=229 for black, n=337 for Hispanic or Latino, and n=61 for Asian and one or more races) although the smaller sample sizes for non-Caucasians, particularly Asians, limit conclusions. Single 10 mg doses of SYMLIN (83 times the maximum recommended dose of 120 mcg for patients with type 2 diabetes) were administered to 3 healthy volunteers. All 3 individuals reported severe nausea associated with vomiting, diarrhea, vasodilatation, and dizziness. No hypoglycemia was reported. Pramlintide has a short half-life (approximately 48 minutes in healthy individuals). Initiate supportive measures in the case of overdose. SYMLIN® (pramlintide acetate) injection is an anti-diabetic medication for use in patients with diabetes treated with insulin. Pramlintide is a synthetic analog of human amylin, a naturally occurring neuroendocrine hormone synthesized by pancreatic beta cells that contributes to glucose control during the postprandial period. Pramlintide is provided as an acetate salt of the synthetic 37-amino acid polypeptide, which differs in amino acid sequence from human amylin by replacement with proline at positions 25 (alanine), 28 (serine), and 29 (serine). Pramlintide acetate is a white powder that has a molecular formula of C171H267N51O53S2• × C2H4O2 (3≤ × ≤8); the molecular weight is 3949.4. Pramlintide acetate is soluble in water. SYMLIN is formulated as a clear, isotonic, sterile solution for subcutaneous administration. 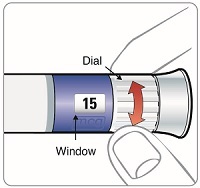 The disposable multidose SymlinPen® pen-injector contains 1000 mcg/mL of pramlintide (as acetate). The formulation contains 2.25 mg/mL of metacresol as a preservative, D-mannitol as a tonicity modifier, acetic acid, sodium acetate as pH modifiers, and water for injection. SYMLIN has a pH of approximately 4.0. Pramlintide is an analog of human amylin. Amylin is colocated with insulin in secretory granules and cosecreted with insulin by pancreatic beta cells in response to food intake. 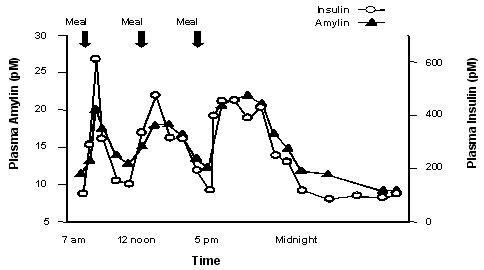 Amylin and insulin show similar fasting and postprandial patterns in healthy individuals (Figure 1). In patients with type 1 and type 2 diabetes, there is reduced secretion from pancreatic beta cells of both insulin and amylin in response to food. Amylin affects the rate of postprandial glucose appearance through a variety of mechanisms, as determined by nonclinical studies. Amylin slows gastric emptying (i.e., the rate at which food is released from the stomach to the small intestine) without altering the overall absorption of nutrients. In addition, amylin suppresses glucagon secretion (not normalized by insulin alone), which leads to suppression of endogenous glucose output from the liver. Amylin also regulates food intake due to centrally-mediated modulation of appetite. In human studies, pramlintide, acting as an amylin analog, slows gastric emptying, reduces the postprandial rise in plasma glucagon, and modulates satiety leading to decreased caloric intake. In clinical studies in patients with type 1 diabetes and patients with type 2 diabetes using mealtime insulin, SYMLIN reduced mean postprandial glucose concentrations, reduced glucose fluctuations, and reduced food intake. In a randomized, single-blind, placebo-controlled, crossover study, 19 subjects with type 2 diabetes using insulin lispro, 19 subjects with type 1 diabetes using regular human insulin, and 21 subjects with type 1 diabetes using insulin lispro underwent mixed-meal tests. 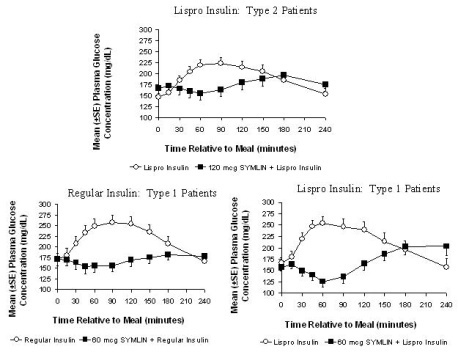 SYMLIN administered subcutaneously immediately prior to a meal reduced plasma glucose concentrations following the meal when used with mealtime insulin (rapid-acting insulin analogs or regular human insulin) (Figure 2). When rapid-acting insulin analogs were used, plasma glucose concentrations tended to rise during the interval between 150 minutes following SYMLIN injection and the next meal [see Dosage and Administration (2)]. While SYMLIN reduces postprandial glucose, clinical studies employing a controlled hypoglycemic challenge have demonstrated that SYMLIN does not alter the counter-regulatory hormonal response to insulin-induced hypoglycemia. Likewise, in SYMLIN-treated patients, the perception of hypoglycemic symptoms was not altered with plasma glucose concentrations as low as 45 mg/dL. In a separate clinical trial pramlintide also reduced the 24-hour glucose fluctuations based upon 24-hour glucose monitoring. A single, subcutaneous dose of 30 mcg of SYMLIN to patients with type 1 diabetes and 120 mcg of SYMLIN to patients with type 2 diabetes administered 1 hour prior to an unlimited buffet meal was associated with reductions in total caloric intake (placebo-subtracted mean changes of ~21% and 23%, respectively), which occurred without decreases in meal duration. The absolute bioavailability of pramlintide following a single subcutaneous dose of SYMLIN is approximately 30% to 40%. Subcutaneous administration of different doses of SYMLIN into the abdominal area or thigh of healthy individuals showed a linear, dose-dependent increase in maximum plasma concentrations (Cmax) and overall exposure (AUC) (Table 5). Injection of SYMLIN into the arm in obese patients with type 1 or type 2 diabetes showed higher overall exposure (20%-36%) with greater variability (% CV for AUC: 73%-106%), compared with exposure after injection of SYMLIN into the abdominal area or thigh. Relative bioavailability of pramlintide was not significantly different between obese and non-obese patients and based on BMI or skin fold thickness. Injections administered with 6.0-mm and 12.7-mm needles yielded similar bioavailability. SYMLIN does not extensively bind to red blood cells or albumin (approximately 40% of the drug is unbound in plasma). In healthy individuals, the half-life of pramlintide is approximately 48 minutes. The primary metabolite, Des-lys1 pramlintide (2-37 pramlintide), is biologically active in vitro. Overall exposure (AUC) to pramlintide is relatively constant with repeat dosing of SYMLIN, indicating no bioaccumulation. No studies have been conducted in patients with end-stage renal disease. In a single-dose pharmacokinetic study in patients with type 1 diabetes, 60 mcg of SYMLIN was administered to 4 patients with normal renal function (ClCr >90 mL/min), 9 patients with mild renal impairment (ClCr 60-89 mL/min), 5 patients with moderate renal impairment (ClCr 30-59 mL/min) and 3 patients with severe renal impairment (ClCr 15-29 mL/min). No statistically significant differences were noted in total (AUC0-∞) and peak (Cmax) exposure of pramlintide for mild, moderate, and severe renal impairment categories in comparison to patients with normal renal function; although, inter-patient variability in pharmacokinetic parameters was high. Pharmacokinetic studies have not been conducted in the geriatric population [see Use in Specific Populations (8.5)]. The efficacy and safety of SYMLIN have not been established in the pediatric population. The use of SYMLIN is not recommended in pediatric patients due to the risk of severe hypoglycemia [see Warnings and Precautions (5.1, 5.2)]. No study has been conducted to evaluate the effect of gender on pramlintide pharmacokinetics. No study has been conducted to evaluate the effect of ethnicity on pramlintide pharmacokinetics. Pharmacokinetic profiles of pramlintide and insulins after coadministration of 30 mcg SYMLIN with different insulins (regular, NPH, and 70/30 premixed formulations of recombinant human insulin) as one subcutaneous injection, premixed in one syringe, were compared to those observed after the coadministration of SYMLIN and different insulins given as separate subcutaneous injections. The effects of premixing on pramlintide pharmacokinetics varied across the different insulin products with a maximum decrease of 40% in pramlintide Cmax and a maximum increase of 36% in pramlintide AUC0-∞. Similarly, effects of premixing on insulin pharmacokinetics varied across different insulin products with a maximum increase of 15% in insulin Cmax and up to a 20% increase in insulin AUC0-600min. Always administer SYMLIN and insulin as separate injections and never mix [see Warnings and Precautions (5.4)]. When 1000 mg acetaminophen was given within 0, 1, and 2 hours after a 120 mcg SYMLIN injection in patients with type 2 diabetes (n=24), acetaminophen Cmax decreased by 29%, 23%, and 20%, respectively compared to placebo. The time to maximum plasma concentration or Tmax increased by 72, 48, and 48 minutes, respectively. SYMLIN did not significantly affect acetaminophen Tmax or Cmax when acetaminophen was administered 1 to 2 hours before SYMLIN injection. SYMLIN did not affect acetaminophen AUC regardless of the time of acetaminophen administration in relation to SYMLIN injection. When a single dose of a combination oral contraceptive product, containing 30 mcg ethinyl estradiol and 300 mcg norgestrel, was administered 15 minutes after SYMLIN injection (90 mcg dose) in healthy female subjects, there was no statistically significant change in the Cmax and AUC of ethinyl estradiol. However, the norgestrel Cmax was reduced by about 30% and Tmax was delayed by 45 minutes; there was no effect on norgestrel AUC. The clinical relevance of this change is unknown. The effect of concomitant administration of SYMLIN and ampicillin was evaluated in healthy volunteers. The administration of a single oral 500 mg dose of ampicillin 15 minutes after a single dose of SYMLIN (90 mcg) did not alter the Cmax or AUC for ampicillin. However, the Tmax for ampicillin was delayed by approximately 60 minutes. A two-year carcinogenicity study was conducted in CD-1 mice with doses of 0.2, 0.5, and 1.2 mg/kg/day of SYMLIN (32, 67, and 159 times the exposure resulting from the human dose of 360 mcg/day based on area under the plasma concentration curve or AUC, respectively). No drug-induced tumors were observed. A two-year carcinogenicity study was conducted in Sprague-Dawley rats with doses of 0.04, 0.2, and 0.5 mg/kg/day of SYMLIN (3, 9, and 25 times the exposure resulting from the human dose of 360 mcg/day based on AUC, respectively). No drug-induced tumors were observed in any organ. Administration of 0.3, 1, or 3 mg/kg/day of SYMLIN (8, 17, and 82 times the exposure resulting from the human dose of 360 mcg/day of mcg based on body surface area) had no significant effects on fertility in male or female rats. The highest dose of 3 mg/kg/day resulted in dystocia in 8/12 female rats secondary to significant decreases in serum calcium levels. A total of 2333 patients with type 1 diabetes and 1852 patients with type 2 diabetes received SYMLIN in controlled clinical trials. The efficacy and safety of SYMLIN were evaluated in 3 (26-52-week), randomized, double-blind, placebo-controlled trials in patients with type 1 diabetes. In these studies, insulin adjustments were minimized in order to isolate the SYMLIN effect with insulin adjustments allowed, at the investigator's discretion, when excessive hypoglycemia was encountered. Patients participating in these 3 trials had a mean age of 40 years, a mean duration of diabetes of 17 years, and a mean body mass index of 25.9 kg/m2. Table 6 summarizes the 6-month results for those patients assigned to the 30 or 60 mcg dose of SYMLIN or placebo. SD: standard deviation; LSM: least squares mean; SE: standard error; U: Units; NM: not measured; TID: 3 times a day; QID: 4 times a day. Statistically significant reduction compared to placebo (p-value <0.05). In the three studies, from a mean baseline body weight of 75.3 kg, 73.3 kg, and 76.6 kg, respectively, after randomization there were corresponding mean reductions of –0.8 kg, –1.6 kg, and –1.3 kg (60 mcg TID) and –0.8 kg (60 mcg QID) in the SYMLIN treatment group compared to mean increases of +0.8 kg, +0.4 kg, and +0.7 kg in the placebo treatment group. A dose-titration study of SYMLIN was conducted in patients with type 1 diabetes who had a mean age of 41 years, a mean duration of diabetes of 20 years, and a mean body mass index of 28 kg/m2. Patients with a mean baseline HbA1c of 8.1% (range 6.5%-10.7%) were randomized to receive either SYMLIN or placebo, both administered before major meals as add-on to insulin therapy. SYMLIN was initiated at a dose of 15 mcg and titrated upward at weekly intervals in 15 mcg increments to maintenance doses of 30 or 60 mcg, based on whether patients experienced nausea. Upon initiation of SYMLIN, the insulin dose (mostly the mealtime insulin) was reduced by 30% to 50% in order to minimize the occurrence of hypoglycemia. Once the maintenance dose of SYMLIN was reached, insulin dose adjustments were made according to standard clinical practice, based on pre- and post-meal blood glucose monitoring. Table 7 summarizes the 6-month results for the dose-titration study. SD: standard deviation; LSM: least squares mean; SE: standard error; U: Units. In the dose titration study, from mean baseline body weight of 81.5 kg, after randomization there was a mean reduction of –1.33 kg in the SYMLIN treatment group compared to a mean increase of +1.25 kg in the placebo treatment group. The efficacy and safety of SYMLIN were evaluated in 2 (a 26-week and a 52-week) randomized, double-blind, placebo-controlled trials in patients with type 2 diabetes. These trials enrolled patients with inadequate glycemic control (HbA1c >8%) on fixed dose insulin. In both trials, SYMLIN or placebo was added to existing insulin therapies. Concomitant use of a sulfonylurea and/or metformin was permitted. Insulin doses were to be kept as stable as possible throughout the treatment period to isolate the SYMLIN effect. Patients participating in these 2 trials had a mean age of 57 years and a mean duration of diabetes of 13 years. Mean body mass index was 32.9 kg/m2 for SYMLIN and 32.2 kg/m2 for placebo. Table 8 summarizes the 6-month results for each trial for those patients assigned to the 120 mcg dose of SYMLIN and placebo. In both studies, from a mean baseline body weight of 96.7 kg, and 85.6 kg, respectively, after randomization there were corresponding mean reductions of –1.4 kg, and –1.6 kg in the SYMLIN treatment group compared to mean increases of +0.3 kg, and +0.1 kg in the placebo treatment group. SYMLIN pen-injectors not in use: Refrigerate (2°C to 8°C; 36°F to 46°F), and protect from light. Do not freeze. Do not use if product has been frozen. Unused SYMLIN (opened or unopened) should not be used after the expiration (EXP) date printed on the carton and the label. SYMLIN pen-injectors in use: After first use, refrigerate or keep at a temperature not greater than 86°F (30°C) for 30 days. Use within 30 days, whether or not refrigerated. Discuss the risk and consequences of hypoglycemia and approaches to minimize its occurrence. Inform patients about the importance of self-management practices including glucose monitoring and timing of dosing. In addition, reinforce the importance of adherence to meal planning, physical activity, recognition and management of hypoglycemia and hyperglycemia, and assessment of diabetes complications. Advise patients that they must never share a SymlinPen with another person, even if the needle is changed, because doing so carries a risk for transmission of blood-borne pathogens. Inform patients that SYMLIN and insulin should always be administered as separate injections and never be mixed. Show patients how to administer SYMLIN using the pen-injector. 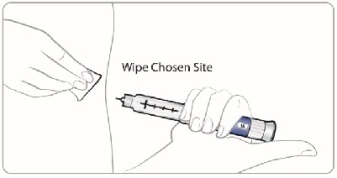 Advise patients to use a new needle for each injection. Inform patients of the potential risks and advantages of SYMLIN therapy. Advise women with diabetes to inform their healthcare professional if they are pregnant or contemplating pregnancy. Instruct patients on the proper injection technique and proper storage of SYMLIN. Instruct patients on handling of special situations such as intercurrent conditions (illness or stress), an inadequate or omitted insulin dose, inadvertent administration of increased insulin or SYMLIN dose, inadequate food intake or missed meals. Refer patients to the SYMLIN Medication Guide and Patient Instructions for Use for additional information. Read this Medication Guide and Instructions for Use that come with your SYMLIN before you start using it and each time you get a refill. There may be new information. This Medication Guide does not take the place of talking to your healthcare provider about your medical condition or treatment. People who have severely low blood sugar have had injuries while driving their car, operating heavy machinery or doing other dangerous activities. You and your healthcare provider should talk about a plan to treat low blood sugar. You should have fast-acting sugar (such as hard candy, glucose tablets, juice) or glucagon for injection with you at all times. Call your healthcare provider if you have severe low blood sugar or if you have low blood sugar more often than normal. SYMLIN is taken at mealtimes. The use of SYMLIN does not replace your daily insulin but may lower the amount of insulin you need, especially before meals. Do not share your SymlinPen with other people, even if the needle has been changed. You may give other people a serious infection, or get a serious infection from them. SYMLIN is an injectable prescription medicine used to treat adults with type 1 and type 2 diabetes to control blood sugar. SYMLIN is used when your mealtime insulin dose has not controlled your blood sugar well enough. are allergic to SYMLIN or any ingredients in SYMLIN. See the end of this Medication Guide for a complete list of ingredients in SYMLIN. What should I tell my healthcare provider before using SYMLIN? are pregnant or plan to become pregnant. It is not known if SYMLIN will harm your unborn baby. You and your healthcare provider should decide how to best control your blood sugar levels during pregnancy. are breastfeeding or plan to breastfeed. It is not known if SYMLIN passes into your breast milk. You and your healthcare provider should decide about the best way to feed your baby if you are using SYMLIN. Tell your healthcare provider about all the medicines you take, including prescription and over-the-counter medicines, vitamins, and herbal supplements. SYMLIN slows stomach emptying and can affect medicines that need to pass through the stomach quickly. Read the “Instructions for Use” and the Medication Guide and that come with your SYMLIN for information about the right way to use SYMLIN. Use SYMLIN exactly as your healthcare provider tells you to use it. Your healthcare provider will tell you how much SYMLIN to use and when to use it. To reduce the risk of hypoglycemia, it is important that you plan your meals and physical activity every day while you use SYMLIN. Plan for what you will eat and when you will eat your meals. The amount of SYMLIN you use will depend on whether you have type 1 or type 2 diabetes. The way you inject SYMLIN is similar to the way you inject insulin. Inject SYMLIN under the skin of your stomach area (abdomen) or upper leg (thigh). 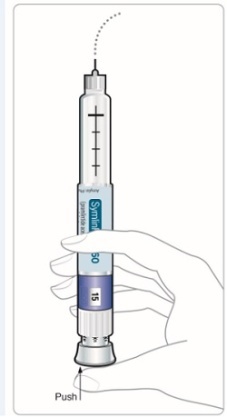 Inject SYMLIN at a site that is more than 2 inches away from your insulin injection. Do not inject SYMLIN and insulin in the same site. Use a new needle for each SYMLIN injection. Do not reuse or share your needles with other people. You may give other people a serious infection, or get a serious infection from them. If you take more than your prescribed dose of SYMLIN, you may get nauseous or vomit, and may not be able to eat the amount of food you usually eat. If you take more SYMLIN than your prescribed dose, pay careful attention to the amount of insulin you use because you may be at more risk for low blood sugar. Contact your healthcare provider for guidance. Do not share your SymlinPen with other people, even if the needle is changed. You may give other people a serious infection or get a serious infection from them. When starting SYMLIN, you will need to reduce your dose of mealtime insulin. Your healthcare provider will tell you how to reduce your dose of mealtime insulin the right way. You must check your blood sugar as often as your healthcare provider tells you to, which may include before and after every meal and at bedtime. The usual starting dose of SYMLIN for people who have type 1 diabetes is 15 micrograms (mcg) injected under your skin. Inject SYMLIN under your skin (subcutaneously) just before a major meal. A major meal must have at least 250 calories or 30 grams of carbohydrate. If you have not had any nausea for 3 days or more after your dose of SYMLIN is changed, your healthcare provider may tell you to slowly increase your dose of SYMLIN. Do not increase your dose of SYMLIN unless your healthcare provider tells you to. Tell your healthcare provider right away if you have nausea or low blood sugar after your dose of SYMLIN is changed. Your healthcare provider will tell you what to do. Your healthcare provider may make changes to your insulin dose to better control your blood sugar. Your healthcare provider should tell you what the right dose of insulin is for you. You must check your blood sugar as often as your healthcare provider advises you to, which may include before and after every meal and at bedtime. The usual starting dose of SYMLIN for people who have type 2 diabetes is 60 micrograms (mcg) injected under your skin. If you have not had any nausea for 3 days or more after your dose of SYMLIN is changed, your healthcare provider may tell you to increase your dose of SYMLIN. Do not increase your dose of SYMLIN unless your healthcare provider tells you to. Do not drive, operate machinery, or do other dangerous activities until you know how SYMLIN affects you. Talk to your healthcare provider about the activities you should avoid. Alcohol. Drinking alcohol may increase your chances of getting severe low blood sugar. Keep SYMLIN in the refrigerator between 36°F to 46°F (2°C to 8°C), until you are ready to use it. Do not freeze. Do not use SYMLIN if it has been frozen. Keep unopened SYMLIN out of the light. Keep SYMLIN either in the refrigerator or at room temperature between 36°F to 86°F (2°C to 30°C) for up to 30 days. Throw away used SYMLIN after 30 days of use, even if the pen still has medicine in it. Do not use SYMLIN (opened or unopened) after the expiration (EXP) date printed on the carton and the label. This Medication Guide summarizes the most important information about SYMLIN. If you would like more information, talk with your healthcare provider. You can ask your pharmacist or healthcare provider for information about SYMLIN that is written for health professionals. More information, go to www.SYMLIN.com or call 1-800-236-9933. Read the Medication Guide and these Instructions for Use before you start using SYMLIN and each time you get a refill. There may be new information. Ask your healthcare provider about your dose of SYMLIN and how to inject SYMLIN the right way before you inject it for the first time. This SymlinPen is not recommended for use by the blind or visually impaired without the assistance of a person trained in the proper use of this SymlinPen. Check SYMLIN before you use it. SYMLIN should be clear and colorless. Do not use SYMLIN if the liquid looks cloudy or colored or has lumps or particles in it. Your SymlinPen may look empty because SYMLIN is a clear and colorless liquid. Small bubbles will not hurt you or affect your dose of SYMLIN. Do not transfer SYMLIN from your SymlinPen into a syringe. do not plan to eat. Do not inject SYMLIN if you skip a meal. Wait until the next meal and take your usual dose of SYMLIN at that meal. a new SymlinPen compatible needle (See Figure B). Pen needles are not included. Use 29, 30, or 31 gauge disposable pen needles. Ask your healthcare provider which needle gauge and length is best for you. 1 sharps container for throwing away used SymlinPens and needles. 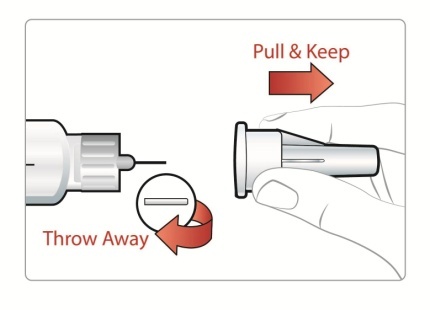 See “Disposing of used SymlinPens and needles” at the end of these Instructions for Use. Check the SymlinPen label before each use to make sure you have the right SymlinPen. Check the expiration date (EXP) on the SymlinPen label (See Figure A). Do not use the SymlinPen past the expiration date printed on the label. Check the liquid in your SymlinPen to make sure you have enough SYMLIN left in your SymlinPen to load your correct dose. The lines on the cartridge show about how much SYMLIN is left in your SymlinPen. When the top of the plunger is at the thickest line on the cartridge, your SymlinPen is almost empty (See Figure C). 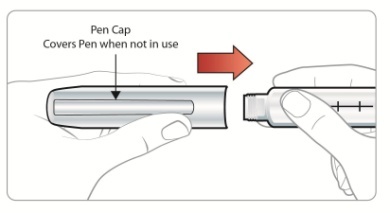 Pull the pen cap straight off the SymlinPen and wipe the rubber seal with an alcohol swab. Peel off the paper tab and throw it away. Push the capped needle straight onto the end of the SymlinPen and twist the needle clockwise until it is tight. Pull off the outer needle cover. Do not throw it away. Pull off the inner needle cover and throw it away. Steps 5 through 7 are only required if you are using your SymlinPen for the first time. Do not repeat Step 1 through 4 before each dose. If you have already primed your SymlinPen, go to Step 8 for instructions about giving your scheduled dose. Turn the dial to select 60 mcg. You should see the number 60 in the window. Pull the knob straight out as far as it will go. You should hear a “clicking” sound while you are pulling the knob out. Hold your SymlinPen with the needle pointing up. Push the knob all the way in until it stops. You should hear a “clicking” sound while you are pushing the knob in. A stream of liquid should be seen from the needle. If you do not see a stream of liquid, repeat Step 6 and Step 7 (you may repeat up to 3 times). 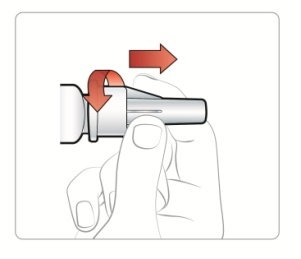 If you still do not see a stream of liquid after 3 attempts, change the needle and repeat Step 6 and Step 7. If you still do not see a stream of liquid, call Information Support. Turn the dial to select the correct dose you need to inject. 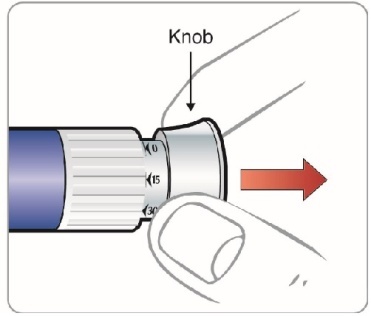 Turn the knob forward or backward until you see the correct dose you need to inject. Check that you see the line to make sure you have loaded your full dose. You should see a line, arrow, and the number of your dose. If you do not see a line, arrow, and the number of your dose, do not inject the dose. Point the needle away from you, push the knob all the way in until it stops, then repeat Step 8 to Step 10. Once the knob has been pulled out, the dial will not move and you cannot reset your dose. 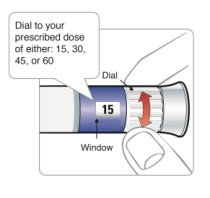 If correct dose was not selected, push in the knob to discard the dose and repeat the instructions. If the knob is pushed in all the way, and you cannot turn the dial, call Information Support. Inject your SYMLIN exactly as your doctor has shown you. Change (rotate) injection sites for SYMLIN. 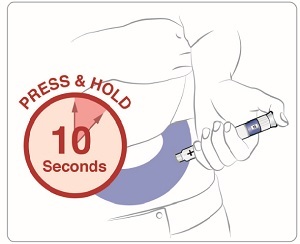 Inject SYMLIN at a site that is more than 2 inches away from your insulin injection. Do not inject SYMLIN and insulin in the same site. To help reduce the chances of getting a reaction at the injection site, let SYMLIN come to room temperature before you inject it. SYMLIN is injected under the skin (subcutaneously) of your stomach area (abdomen) or upper leg (thigh). Put your thumb on the knob and push the knob all the way in until it stops. You should hear the “clicking” as you push and hold the knob in and slowly count to 10 to give your full dose. 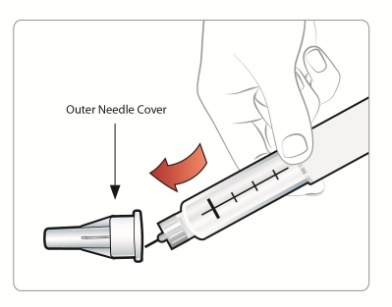 A drop or 2 of liquid on the needle tip is normal. It will not affect your dose. If you see more than 2 drops, you may not have received your full dose. Do not inject another dose. Talk to your doctor for help. 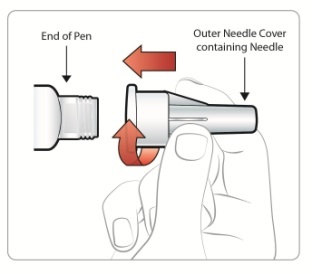 Carefully replace the outer needle cover by pushing straight onto the end of the SymlinPen. 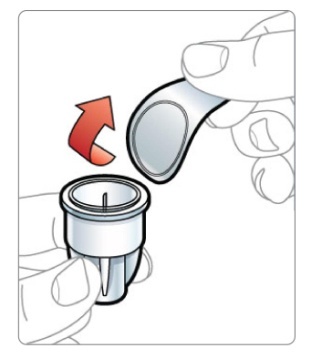 Unscrew the capped needle counterclockwise with the outer needle cover on it and throw it away. Do not store the SymlinPen with the needle attached or with the knob pulled out to prevent air bubbles. Put your used needles and SymlinPen in an FDA-cleared sharps disposal container right away after use. Do not throw away (dispose of) loose needles and syringes in your household trash. How should I store my SymlinPen? Store SymlinPens in the refrigerator or at room temperature between 36°F to 86°F (2°C to 30°C) for up to 30 days. Throw away used SymlinPens after 30 days of use, even if a used SymlinPen still has medicine in it. Do not use SymlinPens (opened or unopened) after the expiration (EXP) date printed on the carton and the label. General information about the safe and effective use of SymlinPens. If you drop your SymlinPen, you should prime it before you use it to make sure your SymlinPen works. Do not use your SymlinPen if any part looks broken or damaged. If you are having problems using your SymlinPen, go to www.SYMLIN.com or call Information Support at 1-800-236-9933. Turn the dial to select 15 mcg. You should see the number 15 in the window. If you do not see a stream of liquid, repeat Step 6 and Step 7 (you may repeat up to 6 times). 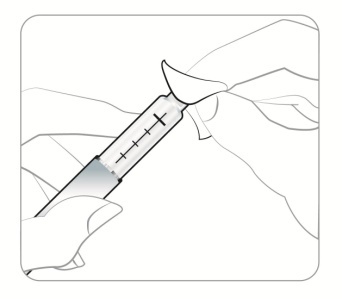 If you still do not see a stream of liquid after 6 attempts, change the needle and repeat Step 6 and Step 7. If you still do not see a stream of liquid, call Information Support. For doses of 15 mcg, 30 mcg, 45 mcg, and 60 mcg. Subcutaneous use only. Pen needles not included. Use 29, 30, or 31 gauge disposable pen needles. Ask your healthcare provider which needle gauge and length is best for you. For doses of 60 mcg and 120 mcg.